Dr. Dean’s not only a medical doctor, but also a naturopath, herbalist, acupuncturist, nutritionist, lecturer, consultant, author. Dr. Dean has been in the forefront of health issues for over 30 years. Click here to read more about her work experience. 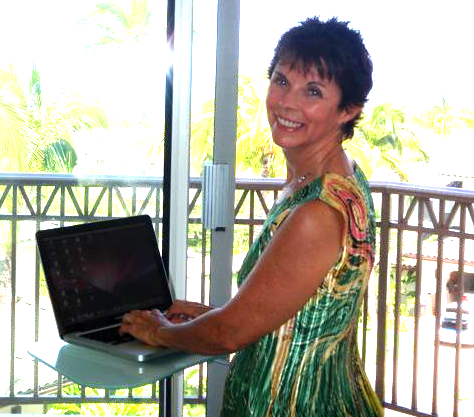 Dr. Dean working from her home in Maui..
Dr. Dean has authored or coauthored over thirty books, including How To Change Your Life With Magnesium, Future Health Now! Encyclopaedia, Death by Modern Medicine: Seeking Safe Solutions, The Magnesium Miracle, The Yeast Connection and Women’s Health, IBS for DUMMIES, IBS Cookbook for DUMMIES and Hormone Balance. For a complete listing of her published work click here. Dr. Carolyn Dean has written over 29 books and is an expert on alternate medicine. Her work, lectures and written material especially on the miracle of Magnesium is must reading. You can learn more about this important mineral and about Dr. Dean by visiting her website, DrCarolynDean.com,2 or by reading her book, The Magnesium Miracle. She’s also on the medical board of the Nutritional Magnesium Association,3 a non-profit organization where you can get free information about magnesium. I started my venture on returning to eating food from Mother Nature to regain my health and had some great success but seemed to be at a few slow spots or even dead ends. I heard an interview by Dr. Mercola of John Douillard and his book Eat Wheat. I read and re-read the book several times and started to use several of the suggestion especially his Kitchari Recipe. What’s So Amazing About Kitchari? Kitchair is a simple, porridge – a blend of beans and rice. It is often referred to as India’s Comfort food or health food. Note: India’s comfort food isn’t anything like what our Western’s idea. Our Idea of comfort food is A bagel covered in cream cheese, Macaroni and Cheese, chocolate marshmallows or a huge pile of French Fries or mashed creamy potatoes. Right! Kitchair ingredients can easily be cooked ahead and frozen into small portions for a quick fix lunch or dinner. Contrary to the Western’s concept, Kitchair health food has many nourishing and cleansing benefits and has used its magic with profound benefits for generations. This recipe lived up to what it promised and helped me return to digesting food rather just burning sugar for energy. I began another detox program this year 2018 using more of his suggestion including Douillard’s alternate to laxatives. I have had great success and highly recommend others to his insightful and unique approach to returning your health. A certified nutritionist and naturopathic doctor, has researched and written 18 health and nutrition books. He was the first to gather together the medical research on the health benefits of coconut oil and present it in a understandable and readable format. He is recognized as one of the leading authorities on the subject. He does not sell coconut oil nor have any financial interest in the coconut industry. A porton of the proceeds from book sales goes to Save the Children Campaign. Success stories concerning coconut oil, range from curing dry skin, stopping and improving Autism and Alzheimers, and healing HIV AIDS. Fife’s book is a must for any health concerned citizen and all health care professionals and family members of those stricken with a serious disease. The following books and tapes are highly recommended. Over 1 million people have autism. This number is rapidly growing. Over the past several years autism has increased to epidemic proportions. Thirty years ago it affected only 1 in 2,500; today 1 out of every 91 children in the United States and 1 out of 64 in the UK are affected. Autism has quickly become a worldwide problem. This book outlines a program using coconut ketone therapy and diet that is backed by decades of medical and clinical research and has proven successful in restoring mental function and improving both brain and overall health. You will learn how to prevent and even reverse symptoms associated with Alzheimer’s disease, Parkinson’s disease, amyotrophic lateral sclerosis (ALS), multiple sclerosis (MS), Huntington’s disease, epilepsy, diabetes, stroke, and various forms of dementia. Foreword by Conrado S. Dayrit, M.D. 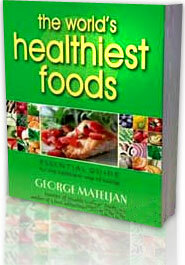 This book discusses the health benefits of coconut oil, meat, milk, and water. In this book you will learn why coconut oil is considered the healthiest oil on earth and how it can protect you against heart disease, diabetes, and infectious illnesses such as influenza, herpes, Candida, and even HIV. The title of this book makes a bold statement. It promises a cure. Is this really possible? Yes, there is a cure to arthritis. You can eliminate arthritis and fibromyalgia pain permanently. Russell L. Blaylock – Renowned neurosurgeon, author and researcher. In 1994 was a clinical assistant professor of neurosurgery to the University of Mississippi Medical Center. He did research on food additives and dietary supplements in his book The Taste that Kills. Both of his parents were inflicted with Parkinson’s disease which he was researching. He has written and co-authored several books including on Excitotoxins and popular web-site. He is president of Theoretical Neurosciences Research, LLC. 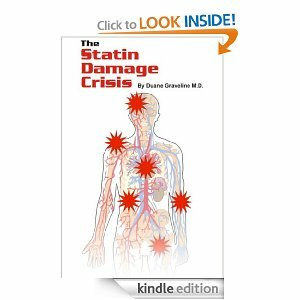 Dr. Duane Graveline MD, MPH – Vocal advocate against the use of the cholesterol lowering drug Statin. He is a former NASA astronaut who used Statin with drastic side effects. 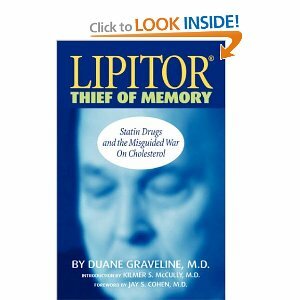 He wrote in 2006 Lipitor Thief of Memory and later wrote The Statin Damage Crisis as a result of all the response to his first book. He also has a website spacedoc.com. 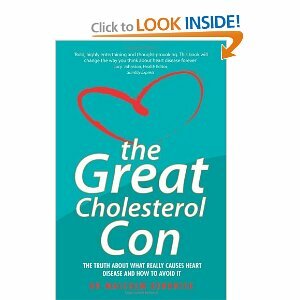 He wrote the book The Great Cholesterol Con. Dr. Joseph Mercola – In 1997 founded his natural health website Mercola.com, it is now among the top 10 health sites on the Internet. He is the author of the 2006 book Sweet Deception and The Great Bird Flu Hoax, and The No-Grain Diet. Dr. Mercola is an osteopathic physician, and has extensive training in natural medicine. He has served at St. Alexius Hospital in Illinois and has been interviewed often in newsprint and TV. “My passion is to transform the traditional medical paradigm in the United States, and that consumes most of my free time. Since 1968, though, I have been an active runner; I completed the Chicago Marathon in just over three hours”. Uffe Ravnskov – (born 1934) is a Danish independent researcher. He has criticized the research of Ancel Keys. He examined Keys data and found no correlation to back up Key’s finding. He is a member of various international scientific organizations, and a former private medical practitioner in Sweden. In recent years he has gained international recognition for his research into numerous scientific studies, leading to the publication of a book which stated that the widely popularized Lipis Hypothesis is scientifically invalid. 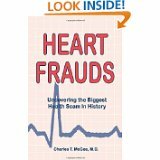 He has also authored The Cholesterol Myth , Fat and Cholesterol are Good for your and Ignore the Award. Dr. Sherri Tenpenny is an expert on women’s health and an outspoken advocate for free choice in healthcare. She is also one of the country’s most knowledgeable and outspoken physicians in the problems associated with vaccines. Dr. Tenpenny is a graduate of the University of Toledo in Ohio. She received her medical training at Kirksville College of Osteopathic Medicine in Kirksville, Missouri. Dr. Tenpenny is the author of two best-selling books, FOWL! Bird Flu: It’s Not What You Think and Saying No To Vaccines: A Resource Guide for All Ages. For more information go to Dr. Tenpenny’s websites at: www.tenpennyIMC.com or www.drtenpenny.com. It has published several reports, including one on hexane used in processing soy products. It also filed legal action against Dean Foods (White Wave), based on the use of the term organic It challenged a USDA marketing order related to almonds, and has filed complaints with the USDA about certain practices of Organic, Aurora Organic Dairy, Horizon Organic, Silk, and others, as they relate to organic standards and regulations. Healthy Ways Newsletter Quick Index to past issues. Provides a long list of how to make your own natural soaps of all kinds. Give it a look. For four years, secondary progressive multiple sclerosis confined Dr. Terry Wahls to a tilt-recline wheelchair. But by using Functional Medicine to create the Wahls Protocol™, Dr. Wahls has transformed her health and body: now she walks easily without a cane and commutes by bicycle. Dr. Wahls uses these diets and protocols in her primary care and traumatic brain injury clinics and is leading a clinical trial to test her protocols on others.